Michael Phelps is being touted as Sportsman of the Year, you'll get no argument from me. The college football awards are being given to the usual suspects; any major program who wants some hardware. Lastly, the Yankees just agreed to pay a pitcher $160 million dollars in the worst economic downturn since The Great Depression. Whose excited for some Keep It Real Friday? Terrell Owens is upset that Tony Romo has a favorite target and it isn't him. I suppose Jeff Garcia and Donovan McNabb would have some input on this situation, no?!?!?! 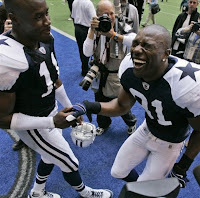 Reports out of Valley Ranch are that the core of Cowboy receivers, Terrell Owens, Patrick Crayton, and the newly acquired Roy Williams are upset that they aren't the primary targets as tight end Jason Witten is and aren't getting enough balls from quarterback Tony Romo. For starters I trust the hands of Jason Witten more than anyone, secondly Romo has thrown the ball to Owens more than Witten over the past two seasons, and lastly your a receiver at best you should touch the ball 7 or 8 times a game. I'll start with Patrick Crayton, he is the easiest of targets right?!?! Crayton single handily cost the Cowboys a playoff win last season against the Giants, maybe that has something to do with Romo not using him as a safety valve. Hey Pat, is it just me or does Cowboy management have other plans considering they just dealt high draft picks to acquire Roy Williams, who ultimately replaces you on the depth chart. When the owner, general manager, offensive coordinator and head coach all think they need an upgrade, your not exactly the "first option" type. Catch a ball, then you can complain. Roy Williams, your going to start complaining now? Really? After Jerry Jones went and pulled you out of Detroit, Detroit who may I remind you hasn't won a game all season and just took Daunte Culpepper off the garbage heap to play quarterback. Now your going to complain? The Lions will not, I'll repeat, the Lions will not win a game the entire season. If I was Roy Williams I would send a thank you card to Jerry Jones and shut the hell up. By the way Roy, real wideouts wear numbers in the 80's, not 11. Now, to my boy T.O., the chosen one, the all encompassing . . . . .shut the **** up, you are the ultimate pain in the *** and are more intolerable than a bad STD. You know why the ball doesn't get thrown your way when the game is on the line? Because you'd never stand up and admit you ran a rout wrong, you won't admit your finding it harder and harder to get separation when your getting older, and lastly, because Shawn Springs flat out abused you earlier this season. It's tired, your whole act is tiring, I defended you just out of pure fandom for the last couple seasons but its getting real old, real fast. Without Tony Romo, you are nothing more than what Randy Moss is without Tom Brady, yes your a talent but you are limited, drastically. If I was Cowboys offensive coordinator, Jason Garrett, who is largely responsible for this train wreck, I'd run the ball 50 straight times with whatever running back I had healthy this week. Let's be honest you have a snowballs chance in hell of beating the Giants without a healthy Marion Barber or Felix Jones, so screw it. Tashard Choice, congrats your up. Furthermore, If I was Jerry Jones I'd walk into the locker room grab Terrell and make him watch those videos of him doing sit-ups like a jackass in his driveway, I'd put the 2007 playoff game against the Giants on loop for Patrick Crayton to see how awful he played when everything was on the line, and then I'd show Roy Williams the clip of backup Lion quarterback, Dan Orlovsky, avoiding the rush by running out the back of his own end zone. You morons want to complain some more? Keep It Real, and stop wasting everybody's time. C.C. a Yankee . . shocking!?!?! No, it isn't and it shouldn't be to anyone. Would you be all that shocked if C.C. 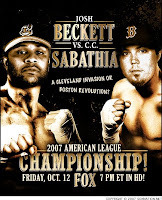 Sabathia turned into a shell of himself come April, May, and June? After the Yanks blew everybody out of the bidding pool a month ago, by offering the lefty-ace a mind numbing $140 million dollars, that wasn't enough. It wasn't that the money was wasn't enough, it was that C.C. just wanted no part of the American League East, the city of New York, and more importantly the added pressure that comes with being the games highest paid pitcher. Sabathia was nearly begging the Dodgers and Brewers to offer him something remotely close to what the Yanks were, but they just wouldn't. For whatever reason Dodgers management couldn't pool their cash together, and the Brewers could only offer $100 million, sorry Milwaukee, that isn't even funny. To C.C. what was important was that he stay in the National League, on the West Coast, and keep his family happy. What became important to C.C., well not to look like a complete jackass for leaving $60 million dollars on the table during one of the countries worst economic time periods. The Yankees were willing to even set a date to determine when they would back off C.C., and if you believed they were doing that, I have a bridge to sell you in Brooklyn. The Yanks were so sickly in need of an ace of the staff in 2008 when just a year ago they could have got a guy who wanted to come to New York, who was better than C.C., and at the end of the day, cheaper. But then again who wants to trade Phil Hughes and Ian Kennedy for lowly Johan Santana, only one of the games premier pitchers of the last decade. Yanks management couldn't contain themselves any longer, after the Boston Red Sox decided to toy with the Yanks and invite C.C. in for an interview, with no intention of giving the wide lefty that kind of cash, the Yanks got nervous. When you or I get nervous, we talk to much, when the New York Yankees get nervous, they drop another $20 million like it was chump change. Well they got their man, after flying out to California, begging Mrs. Sabathia to come to New York and waving $20 million and an opt out clause in front of C.C., he's a Yankee. Who is the last guy who came because of the cash, he's got a mullet and hates New Yorkers. Keep It Real; Money Talks. I know I've actually dedicated quality time to the first portion of this season claiming that the NFC East is the NFL's best division. Spade a spade, I'm wrong. The Cowboys, Eagles, and Redskins have all underachieved. The Cowboys & Skins account for the only two victories of the 2-11 St. Louis Rams. The Eagles have a tie on their record against the 1-11-1 Bengals. Aside from the Giants who are the hands down favorite to win the Super Bowl at 11-2, the NFC East has been a major disappointment. The majority of NFL fans would tell you that this years power division is the unexpected NFC South. Between quarterbacks Jake Delhomme, Jeff Garcia, Matt Ryan, and Drew Brees, the NFC South boasts the NFL's most efficient passers from top to bottom. Brees is on the precipitous of one of the NFL's most dominating statistical seasons, ever. With just two games left he needs only 752 yards to tie Dan Marino's record of 5,084 passing yards in a single season, and he gets the 0-13 Lions in one of those games. With the Saints being virtually eliminated from playoff contention, you don't think Sean Payton isn't going to open the playbook up for Brees to chase down a milestone? Jake Delhomme's Panthers have three games remaining and despite the great play of the New York Giants, if the Panthers win out they'll finish with a 13-3 record owning the tiebreaker against the Giants for home field throughout. Which brings me to my next point. In divisional games, the home team is a mind boggling 10-0. You need any more proof that they know what home field advantage means? The rushing tandem in Carolina, DeAngelo Williams and Jonathan Stewart, have combined for over 1,840 yards and 21 touchdowns. The Tampa Bay Bucs may be the most feared of the possible Wild Card teams. A team with a veteran defense, a veteran quarterback, and whose 6-2 in their last eight games. Finally, while just a year ago they finished 4-12, the Atlanta Falcons led by runaway rookie of the year, Matt Ryan, are 8-5 and staring down the 6th and final playoff spot. From Brees & Ryan to coaches Gruden and Fox, the NFC South is the best division in football and I am only trying to KEEP IT REAL. As always. My bad on releasing Keep It Real so late this Friday; due to the Ice Storms in central Massachusetts I was without power till late this afternoon. As Always, KEEP IT REAL!